I almost forgot about writing this review this year and I am not sure I have much time to write too much this year! When I was trying to think about the highlights of this year I have to admit that I found it difficult. 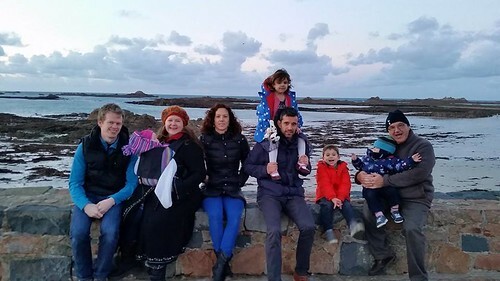 Apart from the birth of Eliza which I will get onto shortly.It seems to me that much about this year has been us coping as a family; learning to live without Mum and what our life and our years look like without her. I have certainly felt her absence keenly and I miss her more than ever. We have been so grateful over the year of the help we have received from the extended family, especially those who have helped us with childcare. 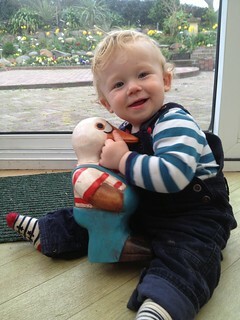 I love this picture of The Little Mister holding onto this duck which lives at Auntie Sandra’s house. The Little Mister spent most Thursday’s with her and Uncle Peter and Auntie Pat. In fact he still calls all the aunts and uncles Pat! In April we were meant to go on holiday to Cyprus with my sister and her family and my Dad, but we didn’t bank on Dad getting a DVT and clots on his lungs and as a result we had to cancel. It was so disappointing, but we also realise that had we flown the effects could have been fatal and we are very grateful that Dad is still with us! 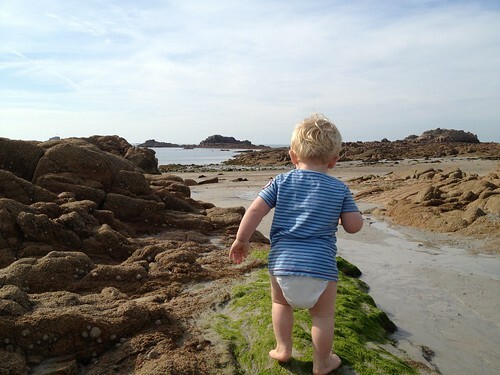 Instead in May we took a trip to Durrell Wildlife Park and stayed in their glamping site. 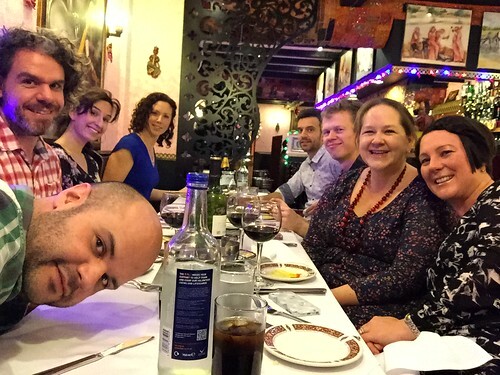 It was brilliant fun and I would thoroughly recommend it. 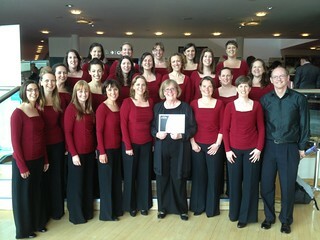 Also in April the choir I sing with competed in the Choir of the Year in Basingstoke. We didn’t get any further than the first round but it was brilliant to get away for a night and I love spending time with the girls. We had such fun! 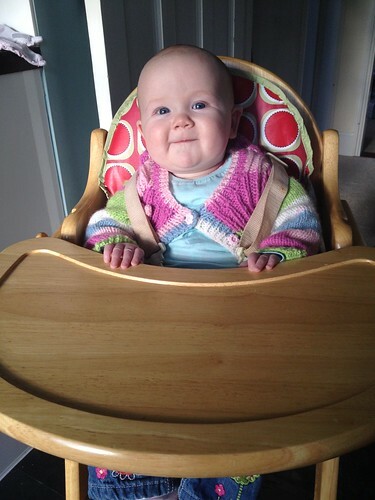 In July we welcomed a brand new arrival, Eliza Gillian Mary. She arrived at great speed and 3 weeks early and suddenly our whole world, especially The Little Mister’s has changed so much. She is an amazingly placid little girl and she has brought so much joy to us all. The fact that she bears Mum’s names has been really special. Of course she arrived at a seriously inconvenient time as my Dad and sister were on holiday in Portugal so they didn’t get to meet her for nearly a week! I love this picture. This is the moment that Dad got to meet his new grand-daughter. The kids look so excited to see her! 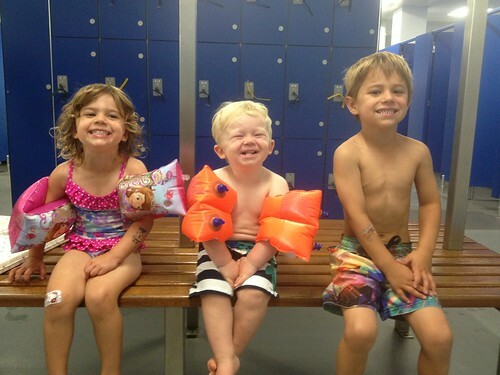 In fact the kids have brought such joy to our lives. They are funny, feisty and trying and whether we are happy or sad they have certainly given us something to live for. The Little Mister and his cousins fight all the time and they tease each other ruthlessly, but I also catch them gently patting him on the head and cuddling him (or trying to strangle him!) I guess they are doing all the things that we did with our cousins. One of the biggest challenges of the year was undertaken by my brother-in-law Philip and his friend Warren. They set out to run seven marathons in seven days to raise money for two charities, This is Epic and The Hub. 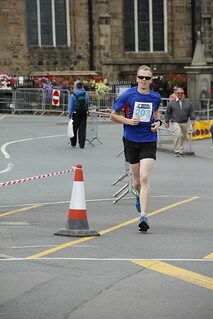 They did an amazing job and finished their run of marathons with the Guernsey Waterfront Marathon. I still think they are completely bonkers but I am totally proud of their achievements. 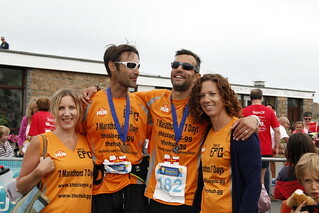 They were joined on their final marathon by The Mister who completed his first ever marathon in 3 hours and 54 minutes. He has since said he has no desire to do any further marathons and he can tick it off his bucket list! The Mister has been amazing over the year. So supportive and he has had to take on a lot more than usual with the arrival of the new baby. I love him so very much and (most of the time) we make a great team! Towards the end of the year Dad opened “Gill’s Garden”; a memorial garden at the school at which my Mum taught. Dad had it built so that the primary school could enjoy being out in the open air, and it was on the spot where Mum used to go hunting to worms! 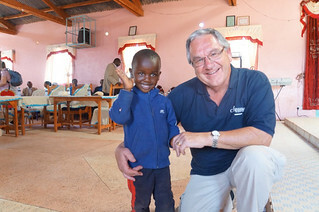 Dad has continued his work with Compassion UK and in November he travelled to Kenya where he met his new sponsor child Paul. 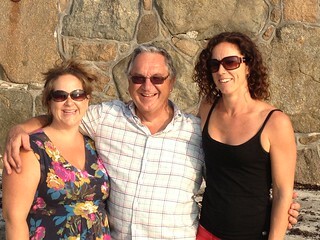 This is one of my favourite pictures of the year – mainly because Dad’s smile actually reaches his eyes. This little boy will never know how lucky he is to have my wonderful dad as his sponsor. 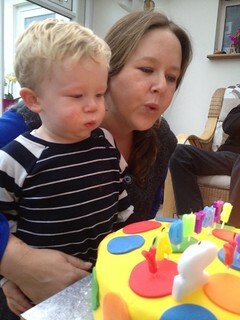 We finished the year with The Little Mister’s 2nd birthday party. A quiet family affair but even that involved lots of screeching children! This little guy has had a few months characterised by epic change! 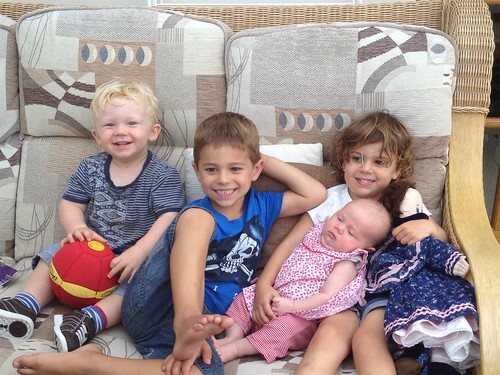 He has gone from being the centre of our world, to being part of the centre – he now has to share with his sister! 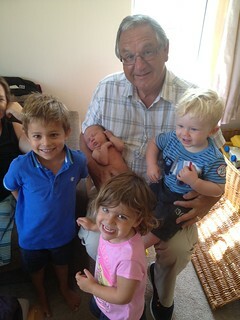 However, he truly loves his “Babby” and I delight in seeing them together! 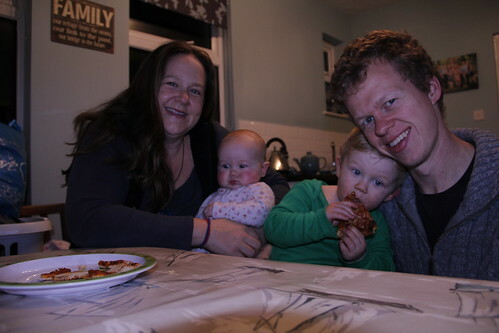 More than ever this year I realise how important our family is to us. I know that without the support of my sister, both emotional and practical, I would have really struggled this year. She has been the person I go to first when I have a problem and for that I am hugely grateful. Thank you for all sharing this journey with me, the comments on my pictures have meant a lot to me. So, I end this final post of the year with a selection of photos which are my favourites of the year. I hope that 2015 will be a year of more fun, exciting experiences and full of joy and hope. Day 365! We have made it! On the final day of this year we have done much tidying and sorting of the house. We are in preperation for my return to work next week after nearly 6 months of maternity and annual leave. I am sure it will be fine but once again our lives take another step forwards. Thankyou to all who have shared in this 365project journey again. This is year three of the project and I am pretty sure I will continue into year 4. I have just been reviewing my Flickr photos and it is just wonderful to see such a selection of snaps of our year. There is so much to remember and so much to be thankful for. 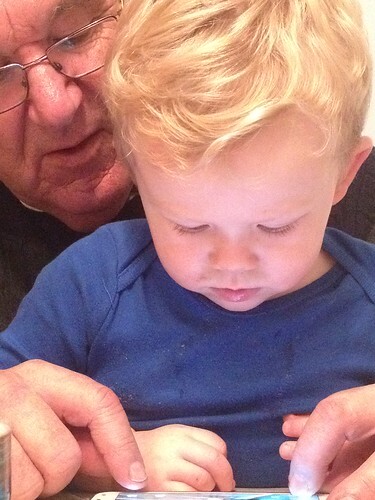 Here is my lovely Dad and my son playing a game on Dad’s phone. The Little Mister is so technology literate it is frightening! He loves the iPad, the computer. the smart phone and he even has a Leapad now which he calls ‘My Top’. He can even go onto the iPhone/iPad and navigate his way to iPlayer and start watching Bing. It’s pretty impressive really. I love watching the concentration on his face as he plays games and manipulates the technology to do what he wants. Clever boy. This morning The Mister and I dropped the kids at the childminders and then we spent several hours tidying up the loft. We have a huge attic space and the problem is that it tends to become a bit of a dumping ground. So, lots of bin bags later and a trip to the Salvation Army and we had managed to get a bit more order. We also shifted some baby stuff around and then brought down the highchair. Already my little Babby is able to sit up comfortably in it, especially as her Uncle David sent the insert for her Christmas present. Time is certainly moving on as we draw to the end of the year. I have suddenly realised that I am due back at work next week. That is going to be an enormous shock to the system for us all I think! Unfortunately I haven’t taken any pictures today so this was snapped on Christmas Day. I hope that The Little Miss like cats. 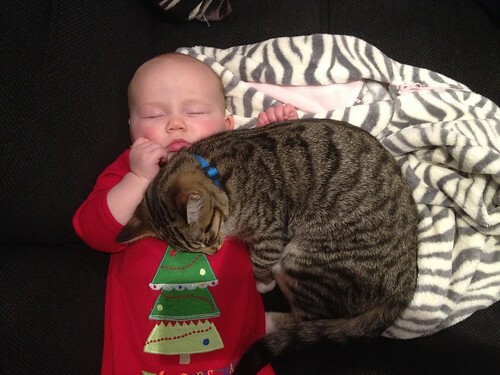 My sister’s kitten seems very fond of snuggling up with her! Today my sister and I went into town to engage in a spot of shopping. This band are called The Rectory Hill Skillet Lickers and they were really good. 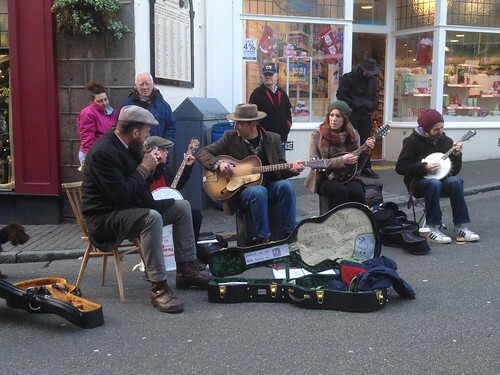 They were playing outside Boots the chemist and it was nice to hear some live music. I suspect they had rather chilly fingers though! 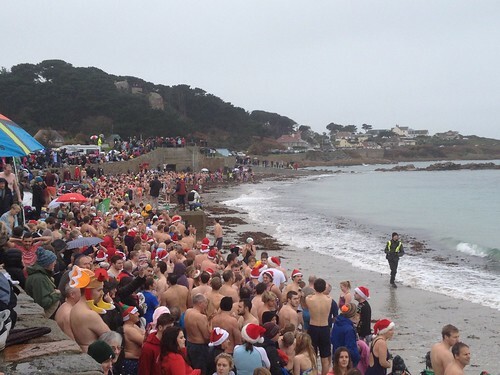 This morning the children and I went to Cobo beach to watch all the nutters of Guernsey do the polar bear swim in aid of the Guernsey Cheshire Home. My brother-in-law went in along with my cousin Stefi and my niece and nephew. The Mister wasn’t able to go this year due to having to work. This year the tide was really high so there was only a few metres of beach for the swimmers to stand on before they went in. Most of the spectators had to watch from the sea wall which made it a really different atmosphere. Christmas Day is really busy these days! Gone are the days of just turning up to Mum and Dad’s house for lunch and finding everything sorted out. My sister and I cooked Christmas lunch and we did a pretty good job again. I even made a trifle for the first time and it was delicious, but there was way too much of it. In fact we had too much of everything. Next year remind me not to get a 14lb turkey crown. I think we are going to be eating turkey for a week! Today we have opened loads of presents, and there have been some brilliant ones, and we spent time with our lovely family. 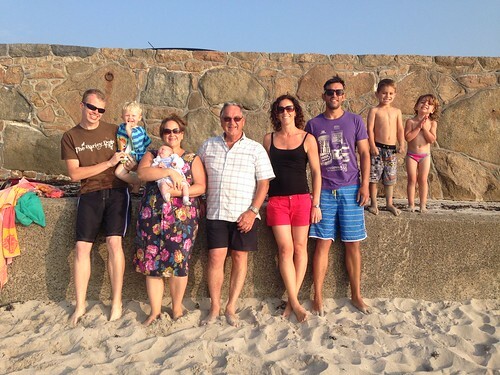 We even managed a quick walk and this photo was taken at Cobo beach. Once again the year has brought us happiness and sadness. 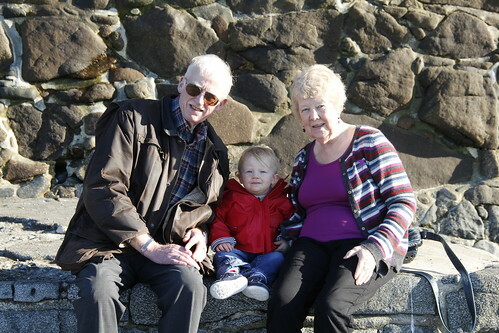 We continue to miss Mum more than ever (in fact I struggled much more this Christmas than last Christmas) but being all together as a family reminds us of all the good things that we continue to have. 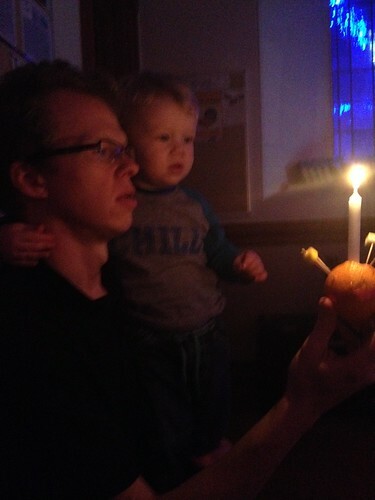 Tonight The Mister and I took the kids to the Christingle service at church. It was all going so well until the candle was lit then The Little Mister started singing Happy Birthday and trying to blow out the candle. The 23rd of December is my birthday and this year I was 39! I had a busy day of Christmas food shopping, doctors appointments and lunch with my Dad.